Leather furniture can be quite durable if it is properly and regularly cleaned with suitable products for sanitising. 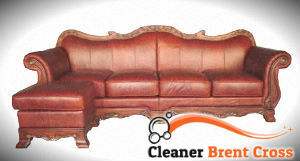 If you use the cleaning services which we provide you will have perfectly maintained sofas which can be used long time. Our staff provide excellent leather sofa cleaning in the NW4 area suitable to be used in domestic and business estates. You will keep your sofas in impeccable condition if you use our cleaning services. They are implemented with specialised cleaning solutions, foams and sprays. The cleaned sofas are covered with sealants for better resistance and protection. Each leather sofa needs specialised detergents and products for sanitising to be rid of the smears, spillages, darkening and grime. Our staff check the fabric of the sofa and choose the best method and supplies for cleaning it. We provide cleaning of aniline, synthetic, velvet, suede and other types of leather using cleaning solutions and foam. The stains and darkened areas are sprayed. The cleaning product is spread on the sofas with a cloth and left to sit there. Then, our staff wipe the dirt and foam from the leather. After cleaning the sofa, our staff use a conditioning sealant to make it resistant to wear and tear. 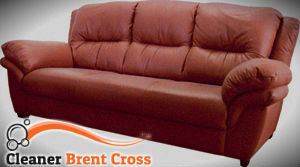 Call us to schedule your leather sofa cleaning which we offer in Brent Cross for a convenient day and time. Every leather sofa needs professional cleaning done at least twice in the year to be in good condition. If you use our services you will protect your leather furniture from early wearing out, cracking, peeling and permanent staining. We guarantee you properly done work with great effect. Our leather sofa cleaning services are available in NW4 during the whole week at fair prices.